On Memorial Day weekend I had some time and was loading up some of my favorite Commodore 64 games via emulation. I started thinking about Doom and wondering why it was not on Apple TV. I did some researching and saw that a couple of Facebook developers got it running on Apple TV, but did not release the source code. Seemed a shame, so I went ahead and started working on porting it over. The original Doom source for iOS is SEVERAL years old, and would not build or compile but I was able to get it up and running on the iPhone just fine with some tweaks and replacing deprecated functions. I am pretty close to having it run, and will publish the changes to GitHub and announce it here when I am done. It is a larger task than I had anticipated. 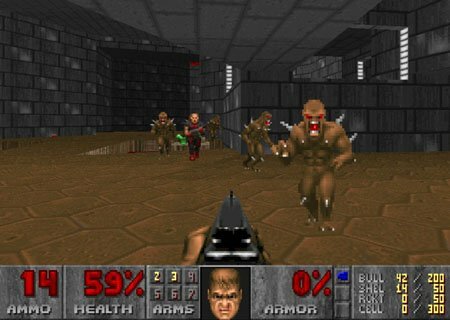 The Facebook developers that did this did not appear to actually implement a menu system or loading up different DOOM WAD’s, but the version I am working on will. NextNext post: Doom for tvOS Running!